Steve Hansen for reviewing the text prior to publication. Over 1,700 years ago, the Fremont and Archaic cultures, and later the Ute tribe, created rock shelters, granaries and rock art on the bottom and sides of Nine Mile Canyon, a stretch of canyon land in Duchesne and Carbon counties that actually spans 40 miles. The over 10,000 petroglyphs (designs etched in stone) and pictographs (designs painted on the rock) make the area the “highest concentration of monochromatic prehistoric rock art in North America,” according to the National Trust for Historic Preservation. The images include both carvings and drawings of hunters with spears and nets, abstract designs, and wildlife like elk, snake and mountain sheep. Hopi elders recognize some of the images as symbols of their clans, which affirms their ancestral connection to the area. While the rock art gets the most attention, Nine Mile Canyon represents the entire spectrum of the life that was lived there thousands of years ago. There are the remains of villages full of pit houses, which were mostly underground with some walls and roof above ground. Granaries are hidden in indentations in the rock walls. The canyon also bears the traces of the more recent history of westward expansion in the form of stagecoach stations, cabins and iron telegraph poles erected by “Buffalo Soldiers” in the 1800s. Contemporary tribes that value the canyon as a place of spiritual heritage include the Ute, Northern Cheyenne and various Pueblo communities, including the Hopi, who have been active in protection efforts. Local residents, archaeologists and tourists all revere the place for its unrivaled glimpse into native art and culture, as well as its stunning natural beauty. In the early 1990s, concerned citizens formed the Nine Mile Canyon Coalition to protect the area from vandalism. At first, the Bureau of Land Management (BLM) — which oversees the federally owned area — encouraged this group, but as its priorities have clashed with the group’s, relations have become tenuous. Since 2004, the BLM has permitted natural gas exploration and drilling in Nine Mile Canyon and the adjacent West Tavaputs Plateau and Desolation Canyon. Seismic testing uses underground detonation and vibration to detect the location and extent of natural gas reserves that lie beneath the canyon. The major drilling company is the Bill Barrett Corp., which, after community protests, limited the amount of drilling in the canyon bottom because of the rock art panels and archaeological sites. While the company agreed not to drill within 300 feet of known panels or rock structures, it can still access reserves underneath by drilling in sideways — a technique known as directional drilling — from the West Tavaputs Plateau to the bottom of the canyon. Industrial activity around the rock art has stirred up dust and caused vibrations, already taking a toll on the art’s visibility. Large industrial trucks, bulldozers and drill rigs drive along the road that goes through the canyon in order to reach the plateau, where the majority of the wells are. Barrett has started to use magnesium chloride as a dust suppressant, but that raises concerns about the chemical seeping into the canyon creek and underground water. A January 2008 report confirmed that dust had clouded the rock art, but BLM argued that the dust cover could be only temporary. The dust study also indicated that the magnesium chloride in the air could be contributing to the corrosion of the rock surfaces. The emissions from industrial activity have also increased the level of ozone in the air. Advocacy from environmental and cultural groups forced the BLM to undertake an environmental impact statement (EIS) before Barrett began extracting natural gas, instead of the simpler environmental assessment. The EIS is meant to weigh citizen concerns and propose several different alternatives for development, but ultimately BLM proceeded with its original intentions. While the EIS was under preparation, Barrett continued to add test wells on the plateau. Then, the Energy Policy Act of 2005 was passed, and BLM was able to use its “statutory categorical exclusion” clause to approve certain oil and gas developments if the disturbed surface area was less than five acres, without following the guidelines of the National Environmental Policy Act and before the EIS was approved. This resulted in dozens of wells around Nine Mile Canyon about which the public had no say. The BLM also managed to sell five additional leases on parcels of land within the canyon itself in 2006. 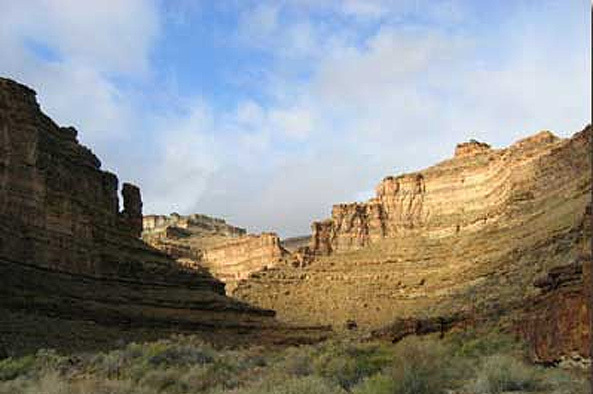 Environmental and cultural groups have pointed out several other major weaknesses in the draft EIS: large areas, including the West Tavaputs Plateau and side canyons, were not surveyed for cultural resources; it lacks information on cultural resources that had been assembled as part of the application to include Nine Mile Canyon on the National Register of Historic Places; it insufficiently considers alternate routes to access the plateau; and it omits the results of a major study on dust levels. Interested nongovernmental organizations, including the Nine Mile Canyon Coalition, the Hopi Cultural Preservation Office, the National Trust for Historic Preservation and the Southern Utah Wilderness Alliance, were denied consulting party status in the draft EIS process. Other ongoing activity in the Nine Mile Canyon area includes Questar Co.’s natural gas pipelines that run along and underneath the canyon bottom; burying pipelines under the surface on the canyon may preserve the aesthetics of the canyon, but it overlooks the fact that underground pipelines still affect the integrity of the canyon. The BLM is considering leases for tar sands and oil shale reserves on the plateau. In June 2008, it approved an increase of vehicular traffic through the bottom of the canyon to Tavaputs from an average of 106 vehicles a day to 441. BLM again used the categorical exclusion clause to override protests from the EPA and input from nongovernmental organizations; a coalition of historic preservation and conservation groups filed a lawsuit in August 2008. Several difficulties present themselves in the case of Nine Mile Canyon. The BLM has been evaluating each resource testing project on a case-by-case basis, rather than looking at the area as a whole, and mitigation has been offered only to certain well-known areas of rock art and archaeological sites. In addition, to define the area worth protecting as limited to the canyon bottom is to ignore all the distinct cultural sites on the slopes and cliffs that surround the canyon floor. Finally, what is often overlooked by every side is that these sites are not just art but a living sacred area. “They call it rock art, because that’s all it is to them … they don’t understand the spirituality. All they understand is what they see,” Cesspooch said. The situation around Nine Mile Canyon is a textbook example of the record-breaking number of oil and gas leases fast-tracked by the administration of George W. Bush. A Washington Post report found that between 2004 and 2008, the number of permits issued was nearly triple the number issued in the corresponding years under President Clinton. In the last few months of the Bush administration, the BLM rushed through six regional Resource Management Plans (RMPs) in southern and eastern Utah. The Price RMP, which includes Nine Mile Canyon, selects only 10 percent of “wilderness character” lands to protect and allows even these areas to be accessed via directional drilling, as long as the surface is kept intact. The new RMPs determine the treatment of Utah wilderness lands for the next two decades, allowing environmental and cultural damage that may not be reversible. Once pipelines cross the land, air quality is diminished, and roads have been constructed, industry can argue more easily for further drilling because the lands will have lost their “wilderness” criteria. The final EIS is still under development; an October 2008 protest letter from the Advisory Council on Historic Preservation appears to have slowed down the process. The Obama administration signaled a possible new direction for Nine Mile Canyon when Interior Secretary Ken Salazar canceled oil and gas drilling leases on 77 parcels of Utah land, including some around Nine Mile Canyon, that were auctioned off at a last-minute Bush administration sale in December 2008. The new administration still has to grapple with the unbalanced priorities embedded in the Price RMP and with its own BLM’s problematic draft EIS for the West Tavaputs Drilling Program. The canyon must be protected as a complete entity, not just singling a few highly visible rock art panels. The impact of directional drilling must be taken into account; just because the surface is not marred does not mean there are not significant subsurface and air pollution threats. For years, canyon supporters have been pushing for the nomination of Nine Mile Canyon to the National Register of Historic Places. The State Historic Preservation Office and the BLM have finally agreed to submit the application; however, they have chosen to do so on a site-by-site basis rather than designate a historic district that would respect the integrity of the canyon as a sacred landscape. While this decision is a disappointment, supporters are encouraged that the nomination is moving forward. Pressure must be kept on the governing entities to work efficiently on the nomination package and to design it with attention to the landscape’s ongoing spiritual importance to the Ute and Hopi, as well as its historic significance. The Southern Utah Wilderness Alliance advocates for Utah’s wilderness lands, including Nine Mile Canyon. Barringer, Felicity. “When the Busy Energy Policy Confronts Ancient Art.” New York Times, June 13, 2004. Eilperin, Juliet. “U.S. Moves Ahead on Oil, Gas Leases on Public Land.” Washington Post, November 29, 2008. Kauffman, Leslie. “Drilling Leases Scrapped in Utah.” New York Times, February 4, 2009. National Trust for Historic Preservation. “Nine Mile Canyon at Risk.” Advocacy Center. Utah Rock Art Research Association. Nine Mile Canyon News.